How are Backup Administrators able to prevent DBAs from filling up the Data Domains, I suppose this is the advantage a 3rd party backup clients may have over this method, retention times are still controlled by the Backup Admin. Fantastic write-up, Dave… thanks! After heading down the Avamar path and being less than impressed with it, we’re rerouting down the DD Boost path. I’m just starting some POC efforts. It was great to read this post. I don’t see anything in the Admin Guide about an option to restore to a file on the regular OS disk (should I need to provide a backup to a vendor for diagnosis, for instance). If that’s not an option, I’m curious if taking an “out-of-cycle” (native SQL) backup will break the recovery chain the same way it does with Avamar, as that would be my only other way to provide an on-disk backup file. My organization has stringent policies against enabling xp_cmdshell so I’ll probably just write a powershell wrapper for the newer versions of SQL since it can be called as a job type under a SQL Agent job. Will probably write an SSIS package for the SQL2005 instances. Real curious to see what the performance of backup/restore with this is, too. Thanks for the comment and I am glad you found it useful. Regarding the question about off cycle backups. I have also not found a way to produce a native .bak file backup from the DD Boost backup data. I believe as long as you do a full database backup using copy only with the native SQL backup it should not affect the sequence. Although, this particular situation is on my list for some additional testing, I think it should work. I would like to hear how things go with performance. With small databases, high change rate databases, and log backups you should see similar performance to native SQL backups using compression. On full backups for larger databases with a lot of static data you should see better and possibly much better performance because less data will be sent over the wire. The PowerShell option is another angle on my list too. I worked on the xp_cmdshell route first because we get more requests for this from our customers and many organizations have it enabled for other purposes. We generally see more restrictions on this in financial and other highly regulated industries. When I run this from the SQL Services account I use directly on the current cluster active node, it works fine. I do not have a SQL cluster setup in my lab so I have not tested the virtual server option. The only advice I can give here is to make sure UAC is completely disabled on the cluster nodes. I have seen issues running the commands via xp_cmdshell when it is enabled. I would try it with and without the -c option to see if it makes a difference. Also I would try some different combinations of using the actual node names in the -c option vs the virtual node name. I have found the documentation could be better around the command line options so a lot of trial and error is required in some situations. I got exactly same issue on Windows cluster. Did you or anybody else solve the problem on clustered environment and will share the solution how to run DD Boost via xp_cmdshell? Please let me know if you are able to name the backup files as you need. I need to backup the DDboost backup to tape for long term retention. Hence there is a need to identify the DB backup filename. Alternatively i would like to specify the backup filename during the backup. Data Domain Boost does not name files as such. You can only label the save set in the DDBoost storage unit. DD Boost for SQL backups are not well suited to be moved to tape. In the scenario you describe the best way to do your long-term tape backup would be to use a periodic (weekly/monthly/quarterly) copy only backup from native SQL Server or from another traditional backup application to be written to tape. DD Boost would be used for your more frequent near-term needs to maximize accessibility and space savings. To reduce the security vulnerability of xp_cmdshell, I included a step at the beginning of the job to enable xp_cmdshell and then one at the end to disable it again. While not perfect, it reduces the risk compared to enabling xp_cmdshell on the instance permanently. Hi Dave & All, We are currently implementing Data Domains into our organisation and I seek some clarification to whether the DDBoost SQL Snap-in can support backing up multiple database instances in the one sql script similar to the traditional SQL maintenance plans e.g *.bak? Our techie consultant also suggested as a work around to create a CIFS share on the Data Domain appliances and configure the traditional SQL maintenance plans to reference this UNC? I would be really interested in getting some thoughts on this process? Sorry for the late reply, had a notification issue with the blog. There are two downsides to using traditional CIFS shares on a DD for SQL backups. One is that CIFS does not perform as well and all data id sent over the wire with no compression. Two, because of this SQL admins will tend to turn on SQL compression on the backups which then greatly reduces the de-duplication of data on the DD. This is the primary reason for using the DDBoost for SQL application. The DDBoost plugin can be used to backup multiple databases, but to do this effectively the use of some T-SQL is needed. I have created a toolkit to help get DBA’s started with this. See the following links. 09 21:31:23 2016. Process Exit Code 2. The step failed. I have not seen this before and it appears the message is coming from the DDBoost application itself. I would recommend verifying the same behavior from the DOS command line as a first step and then if you receive the same error I would open a ticket with EMC support. Please add your SQL Agent account as Local admin and restart sql agent. Your job will not fail. We have just started working with DD Boost in our SQL environment and your scripts have been a tremendous help. I am running into one problem where I need your assistance. When I try to run the following I get an error. 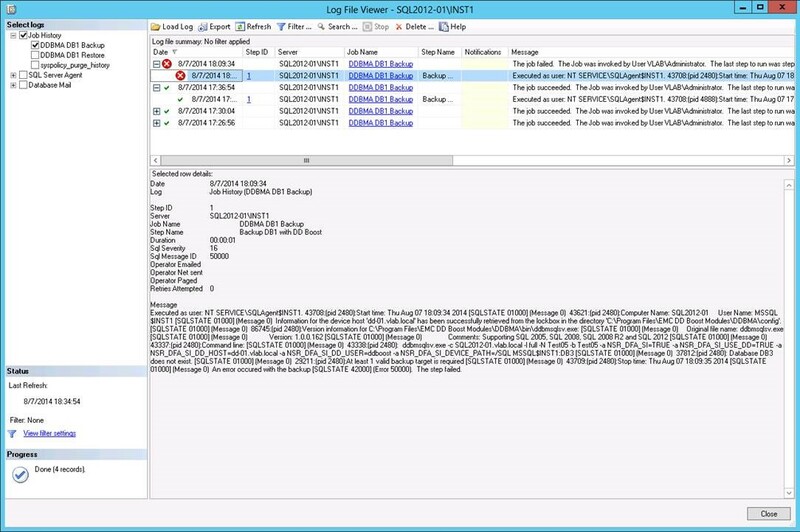 Could not open the log file ‘C:\Program Files\EMC DD Boost Modules\DDBMA\logs\ddbmindexadmin.messages.log’. 6211:ddbmexptool:The LNM logger handle is NULL. I’ve created the ddconfig.cfg file as described in the EMD DD Boost Admin Guide but I can’t find the ddbmindexadmin.messages.log file anywhere on the server. I has been a while since I worked on this, but I have been updating my lab for just that purpose. Can you tell me if you are using the 1.0 or 2.0 plugin? Thank you so much for your reply. We are using the 2.0 plug in. We were able to find the problem. It was a permissions issue on the Config folder. Once we gave the service account used for the SQL agent modify permission to the folder the script worked perfectly. I want to thank you again for your scripts and the support you are providing through your blog for the DD Boost product. We will be putting this into production in the very near future and could not have done it without your assistance. If you give it a time that doesn’t exactly match a backup, it will actually attempt to do a point-in-time restore, which for a database in full recovery mode, will involve rolling forward through tran logs. For a database in SIMPLE recovery mode, however, it will simply restore the last full (or, I presume, differential) backup prior to the datestamp you give it. That actually makes it pretty easy to get the restore you want, by picking a time you know is after the backup completed. I went through your SPs and noticed that all it does is clean up backups which are expired from the repository it has created. Are backups removed from data domain automatically based on their expiry date? Also, if I had to restore one of these backups from a brand new server, do I need to simply install ddboost for SSMS plugin and connect to my existing data domain to view existing backups there if for some reason I don’t have the repository anymore? Any advice on leveraging this toolkit without using xp_cmdshell ? Our organization is heavily regulated and xp_cmdshell is seen as a security risk and therefore not permitted. We have been working with our DBA team to test the latest version of the ddboost plugin and have seen considerable performance gains over previous versions. However, without an easy way to integrate the scheduling and administration of their backups using the ddboost software with their native tools, we will likely be left using a horribly inefficient CIFS solution. One thing I would look at is Version 3.0 of the DDBoost plugin. EMC has been working on their own stored procedures, which are implemented as CLR procedures. This will not require the use of xp_cmdshell. The other method would be to use PowerShell to drive the command line applications from agent jobs. This method does require newer versions of SQL that offer the PowerShell task in the agent. Thanks for your response. Since I posted my question our local EMC sales team reached out to one of their global technology team members and after some testing, they seem to have confirmed that xp_cmdshell can be disabled and backups can still be scripted using native SQL tools. The performance improvements of the 3.0 plugin over previous versions is pretty impressive and if standard SQL scripting can be used without requiring xp_cmdshell, we may be onto something !! I keep getting the raiserror message at the end if though it is successful. I can restore from the backup. It is definitely successful, however still prints the error regardless. I am trying to automate weekly restores to a different server. I would like to have this automated as much as possible. The downside appears that if a new dbf is added to the active db, then I have to modify the script on the restore as well, due to moving the files to the appropriate location. Is there anyway around this? Will there be any dependent files which will not get deleted after expiry date ? I can see many files after retention as well. With DDBEA 3.5 Table level restore is possible. 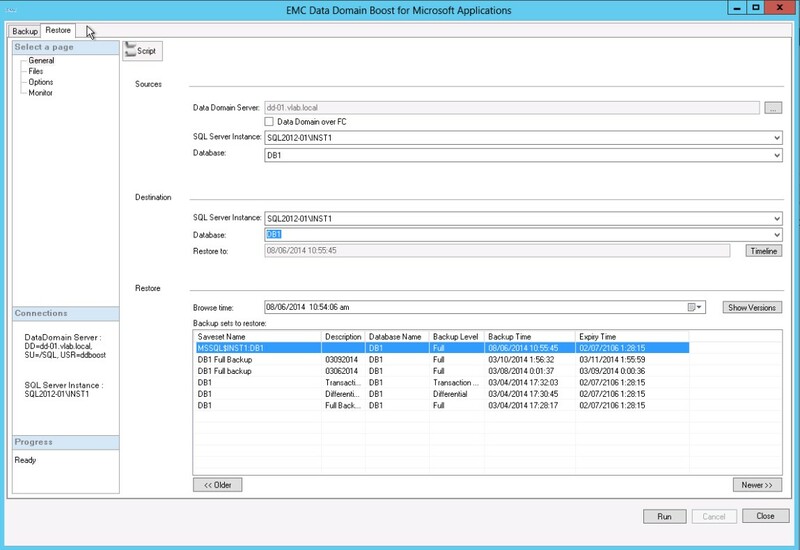 I have one issue, when I have to restore (or refresh) database thru DDBOOST, I select Data Domain Server, then select SQL Server Host for Source Database then when I click on a database I want to refresh/restore it takes very long times to populate all the backups, like 15-25 minutes for a small database which takes less than 3 minutes to restore after I select a backup. Can anyone please let me know the solution, thanks in advance. After doing some troubleshooting with our DBA’s and EMC yesterday I would insure that forward and reverse name resolution is working on your host. We had some weird errors during restore operations and it turned out that we didn’t have reverse lookups working properly. This was resolved with addition of a host file entry on the SQL client. That may not be the source of your problem but it’s something to check. Querying DNS could slow things down while waiting for some kind of timeout. For your information we are using v3.5 of the DDBoost For Microsoft applications plugin and DDOS 5.4.1. Thanks for the post. However, I have little different issue. 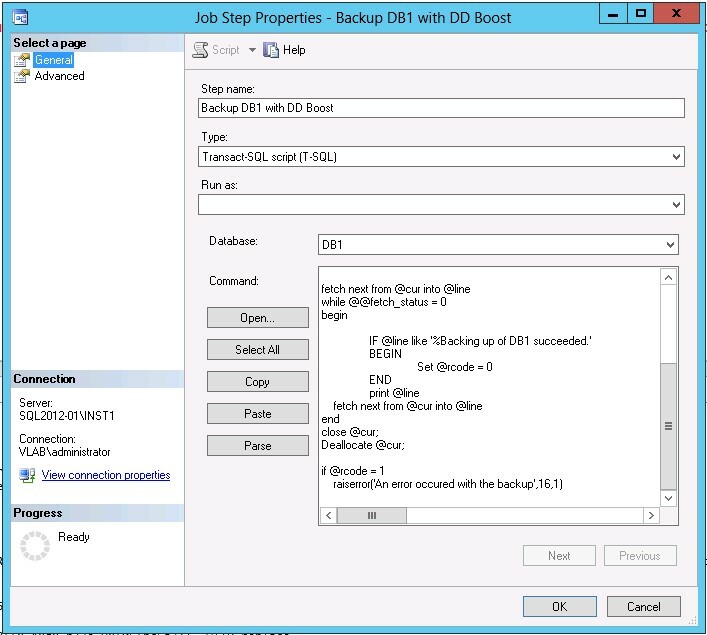 We use DDBoost GUI to backup all databases including system DBs. Now for DR scenario, I want to restore Master first thru DDBoost Gui or command line but it doesn’t work since the Instance is not up. (As some posts suggest to install a new instance then restore Master (replace), I don’t want to do it). So I want pull down backup of Master to local disk then use SQLCMD command to restore master. But I don’t find any command with ddbmsqlrc.exe to copy backup file to local disk. 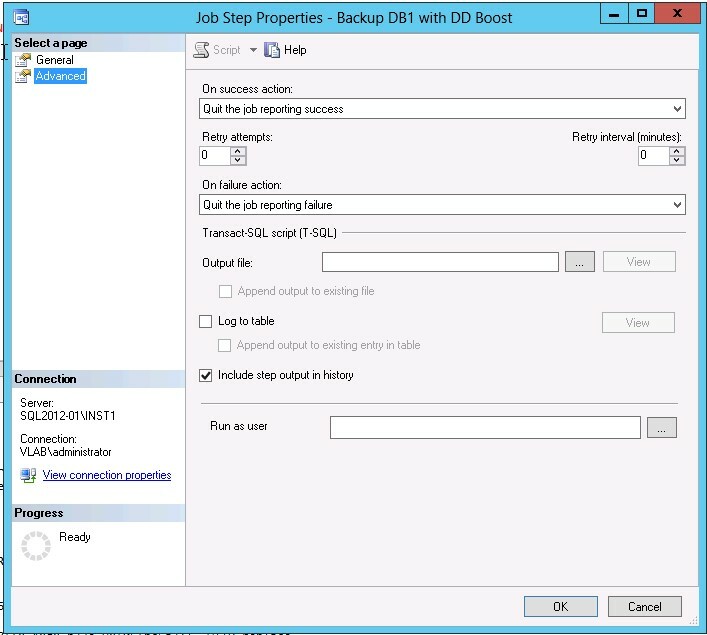 When a database is backed up with DDBoost a .bak file is not created like when backed up via SQL server native tools. DDBoost uses what is called a storage unit which is core to how Data Domain does data reduction. You will have to restore to an online SQL Server. To accomplish what you are attempting you would need a temporary intermediary server. I would consider if that is the right approach to accomplish your end goal.